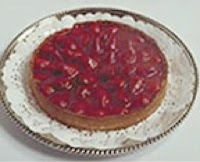 I was going to make a strawberry tarte with lemon curd on the crust, but I didn’t get around to it yet. I will some day. But I did make a strawberry tarte from scratch. Have the pie shell ready. Put in a small saucepan the mashed berries and the sugar. Heat up. In a small dish combine the conflour and water. Stir into the hot berries and when it thickens its done. Add to the 3 cups of cut berries, stir gently to mix. Spoon into the pie shell. Chill about 2 to 4 hours. This dessert could also be made with a packet of gelatin instead of the cornflour, but I haven’t gotten to that one yet.